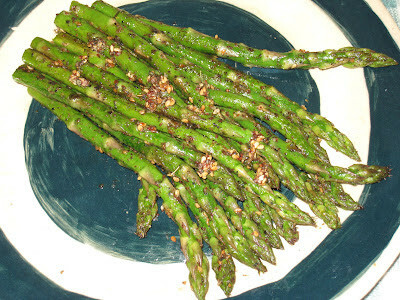 But there is no question that asparagus is a vegetable, and it is one of my favorites. As soon as they show up for the season (and that was this week at Treasure Island) I buy as much as I can and eat as many spears as I can, to tide me over until the next season. I usually prep them as soon as I get them home by trimming the woody ends, layering them in a pie dish and sprinkling them with a tablespoon or two of water, partially cover them with plastic wrap, and microwave them for a few minutes and then putting them in the refrigerator where I can put them on pizzas, in pasta, or just grab a handful or two for a quick snack. This time, I decided to grill them in my cast iron skillet with some olive oil and za'atar that I had put together a few weeks ago and needed to start using again. The result was delicious. The grassy, almost sweet asparagus was the perfect vehicle for the lemony sumac, toasted sesame seeds, and herbs. It would make a beautiful side dish for steak, lamb or chicken. Trim the woody ends from the asparagus and place the spears in a flat dish. Cover them with the olive oil and za'atar and mix everything together. Make sure each spear is well coated. Heat a cast iron skillet over medium high heat until a drop of water sizzles when sprinkled into it. When it is not enough, place a single layer of the asparagus spears into the skillet and cook until they are just tender, about 5 minutes. Remove from the skillet and place on a paper towel-lined plate. Continue with the rest of the asparagus, keeping the spears in a single layer each time, until they are all cooked. Lately I am making brussell sprouts, cauliflower, and french green beans all of the time. Ready for some springtime branching out. This look delicious, my wife will love it! This unseasonably warmer weather we are having sure makes it seem like spring is right around the corner doesn't it, Misreall? We should plan to meet up at the Green Market once it is outside again! And I hope your wife does like it, CCFND - it really is quite delicious. Thanks for stopping by!